It has been established that Lusaka Pastoral Co-ordinator Father Thomas Banda, a known PF cadre is at the centre of the confusion at Regiment Parish of the Catholic Church in Lusaka. Father Banda is known to have been at the centre of unpopular transfers of priests who oppose his treachery but his tricks have been exposed at Regiment Catholic church. Father Thomas Banda has been working with Home Affairs Minister Stephen Kampyongo to intimidate and threaten the church with armed policemen to arrest ‘trouble makers’ who are demanding for transparency and accountability in the church. And it has further been established that immediate parish council chairperson a Mr Lwenje is also in the mix as he is one of the people influencing the transfer of Father Phiri. Last Sunday, Regiment Parish members did not worship but instead closed the church in protest against the transfer of their Priest Philip Phiri. Justice Minister Given Lubinda and his wife who are members of the Parish were caught up in the drama and were booed when they turned up for the Sunday service. Recently, Lubinda donated K20, 000 to the church but this cash mysteriously disappeared in the hands of outgoing parish council chairperson Mr Lwenje. Lwenje has been having parties and drink ups with Father Lubunda at his home and at night clubs. During the protest on Sunday, the Catholics where flashing opposition party symbols as Given Lubinda drove off after failing to congregate. Investigations have shown that Mr Lwenje and his executive had been stealing offertory money from Regiment Parish but Father Phiri had blocked the theft of church funds which led to manoeuvres to remove him from the parish. 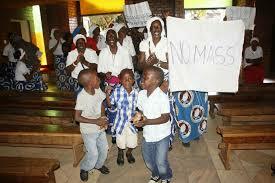 Father Thomas Banda is not loved at Regiment because of many unpopular and selfish actions he imposed on members. For instance, he forced some amendments to the priest’s house and merged two rooms to install a Jacuzzi, mini-bar, private bedroom and other luxuries for his personal use. Parishioners at Regiment, commonly known as Saint Charles Lwanga and located next to Arrakan Barracks have since vowed to disrupt any church service that will be held there in a bid to stop the unpopular transfer of parish priest Father Philip Phiri. “We are not intimidated by the utterances by Father Thomas who openly said he is working with Stephen Kampyongo to send police in riot gear to arrest us. These people must know that the Regiment Parish belongs to the people and not the priests or Kampyongo. They can close this church if they want,” one parishioner said. The protesting members on Sunday demanded to be addressed by Bishop Telesphore Mpundu, who had a stroke recently and is alleged not to be in a position to run the church in Lusaka.